Drupal is one of the powerful Open source CMS which helps you easily organize, manage and publish your content, with an endless variety of customization. Drupal themes are great way to enhance Drupal powered sites by setting out appearance & structure as well as adding some extra flexible functionality to the site. Coders in our Drupal team, knows Drupal better than their spouse. So we bet that we can give birth to innovative PSD to Drupal templates, as we damn love it so much! 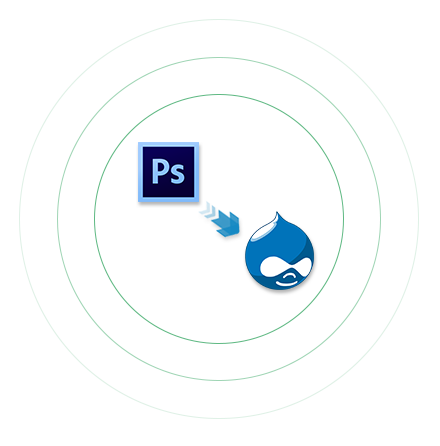 We do not target to complete the project, but we mean to accomplish it successfully as per PSD to Drupal Conversation. We are so confident about our core teams, as we possess a team that has been working on Drupal Since long time. PSD to Drupal conversion are constantly gaining popularity as Drupal is one of the trusted name in development and customization. Drupal conversion services are pointed towards offering customers a thriving web presence. With its exceptional functionalities it yields good results. We have programmers who are qualified and technically sound and they can offer you all PSD to Drupal conversion services. We offer you multilingual websites so that your business grows globally and multiple payment gateway options as well to make things easier both for you and your customers. Our designs are compatible with all the Drupal versions.